IBF light heavyweight world champion Artur Beterbiev, the only current world champion with a 100 percent knockout ratio, will take his iron fists to California for the second defense of his title. 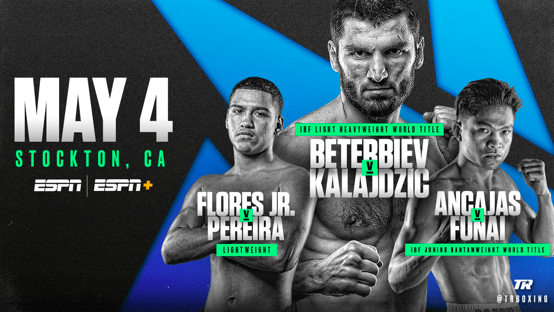 Beterbiev, who recently signed a long-term pact with Top Rank, will face top contender Radivoje “Hot Rod” Kalajdzic in the main event Saturday, May 4 at Stockton Arena. In the co-feature, Jerwin “Pretty Boy” Ancajas, the world’s longest-reigning 115-pound world champion, will make the seventh defense of his IBF junior bantamweight title against No. 1 contender Ryuichi Funai. And, in a six-round lightweight special attraction, 18-year-old Stockton native and blue-chip prospect Gabriel Flores Jr. will face off against Eduardo Pereira. Beterbiev-Kalajdzic, Ancajas-Funai, and Flores-Pereira will be televised live on ESPN and ESPN Deportes (Spanish) at 10 p.m. ET/7 p.m PT. The soon-to-be announced undercard will stream live beginning at 6:30 p.m. ET/3:30 p.m. PT on ESPN+, the direct-to-consumer sports streaming service from The Walt Disney Company’s Direct-to-Consumer & International segment and ESPN. Promoted by Top Rank, tickets priced at $175, $100, $65, $40, and $25 go on sale TODAY, March 19 at 12 p.m. PT, and can be purchased at Ticketmaster.com, by phone at 800-745-3000 or at the Stockton Arena Ticket Office Monday-Friday from 10 a.m.-4 p.m. and beginning three hours prior to event time on event days. Beterbiev (13-0, 13 KOs), a 34-year-old native of Russia, turned pro in 2013 following an amateur career that included a pair of European Championships gold medals and a gold medal at the 2009 World Championships. In only his sixth pro bout, he knocked out former world champion Tavoris Cloud. He won the IBF crown in November 2017 with a fourth-round stoppage over Enrico Kölling in Fresno, California. Beterbiev defended his belt the following October, recovering from a second-round knockdown to stop Callum Johnson in the fourth. Kalajdzic (24-1, 17 KOs) has won three in a row since a highly controversial split decision loss to Marcus Browne, including a fifth-round stoppage over then-unbeaten Travis Peterkin. Flores (12-0, 5 KOs) was one of the great U.S. amateurs in recent memory, a boxing prodigy who signed with Top Rank in 2016 at the age of 16. He became the youngest fighter ever to sign a pro contract with Top Rank and will turn 19 three days before his bout against Pereira. He went 6-0 in 2018 and last fought on Feb. 10, cruising to a six-round unanimous decision over Alex Torres Rynn. Flores is returning home to raise awareness for bullying in his community, a cause that is near and dear to his heart. Ancajas (30-1-2, 20 KOs), a 27-year-old Filipino native, has been one of the most active world champions in modern boxing, defending his belt three times apiece in 2017 and 2018. Unbeaten in 18 fights dating back to 2012, Ancajas is coming off a competitive draw versus Alejandro Santiago and is seeking to rebound against Funai (31-7, 22 KOs), who has won seven consecutive fights. A native of Tokyo, Funai is a former Japanese super flyweight champion who earned top contender status last June with an eighth-round KO over Warlito Parrenas. In his last bout, he knocked out Victor Emanuel Olivo in the second round to extend his KO streak to three. To subscribe to ESPN+, visit www.espnplus.com. Programming on ESPN+ includes hundreds of MLB and NHL games, exclusive UFC and Top Rank boxing events, top domestic and international soccer (Serie A, MLS, FA Cup, UEFA Nations League, EFL Championship, EFL Carabao Cup, Eredivisie, and more), thousands of college sports events (including football, basketball and other sports), Grand Slam tennis, international and domestic rugby and cricket, new and exclusive series, acclaimed studio shows and the full library of ESPN’s award-winning 30 for 30 films. Fans subscribe to ESPN+ for just $4.99 a month (or $49.99 per year) and cancel at any time.